Easter was a time for us to get together as a family. My parents are grandparents 7 times at this stage and it can make for very noisy celebrations. We are extremely fortunate that both my maternal Grandmother and Grandfather are still with us so including them in a family event was a given. When it came to organising the menu for the party, my siblings and I volunteered to bring a dish or an item to contribute to the table. So Mam decided to call it an Easter Tea Party. The majority of the grandchildren are small (as in under 5 years of age) so they love fuss free flavours. 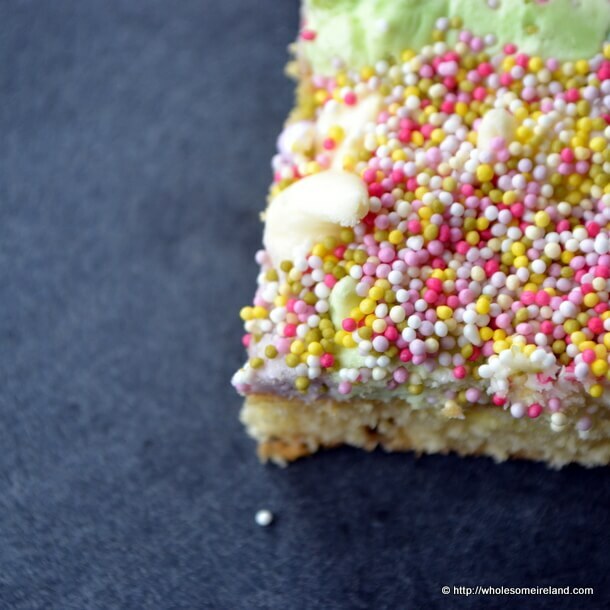 There is nothing like a plain simple vanilla cake with plenty of sprinkles and coloured icing to get kids excited. In fact my 4 year old got so excited that he poured my entire stash directly on top. He was incredibly proud of his handiwork. Mam assembled a gingerbread house, 2 of my siblings made an amazing Simnel Cake and another brought down some tasty snacks and dips. It was (put simply) mayhem in the house but in a good way. The 1 year old stayed true to type and climbed every single surface possible, including pulling out a nest of tables so he could turn it into a staircase to get up to the windowsill. Honestly I need eyes in the back of my head with this one! 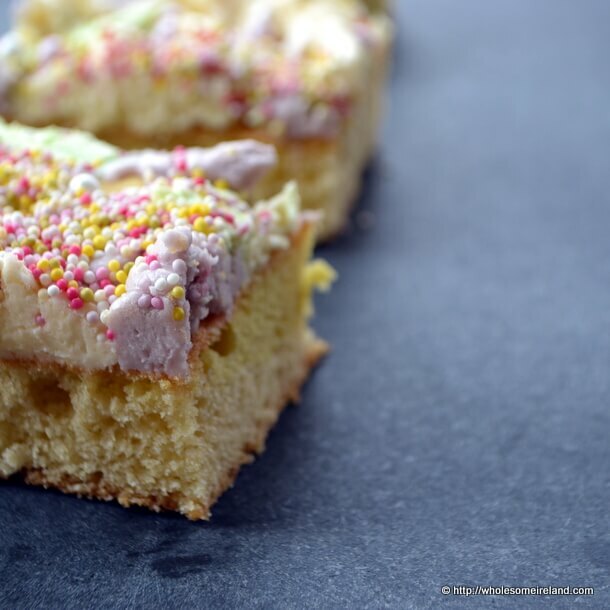 I love making this vanilla cake as a tray-bake because I can transport it easily from house to house, then slice it into bars. You could of course pop some jam on top instead of my simple icing/frosting (which I coloured using food dye) or just eat it as it is slightly warm from the oven. It’s not a fancy recipe, it’s basically a madeira cake which I bake in a deep roasting dish (20 x 26cm). The reason why I bake it in such a deep dish is so that I can pile it high with icing, sprinkles or whatever decoration I need – then cover the top with cling film when I’m transporting it without damaging what is inside. Preheat your (fan) oven to 170 degrees Celcius. Line your baking tray with greaseproof baking paper. Pour in the vanilla extract, beat for a minute until it’s mixed into the batter. Finally, add the flour and baking powder, beat lightly until it becomes a pale, smooth mixture. Pour the cake mixture into the pre-lined baking tray, no need to smooth out the edges this will happen naturally during the baking process. Bake for 20 minutes until golden brown on top. Remove from the oven and allow to cool before icing and transporting. Thanks Adrieanne sometimes the best things are the simple ones! Sounds lovely, I love plain and simple with a cup of tea. It just can’t be beaten Doris. Tea & cake. Marriage made in heaven. these are cute and look yummy! Hi Christina. I would say that it serves 12 adults in medium sized portions. We cut it smaller again for the children. What size tin would you recommend? I’m not sure if you use cm or inches? I’d use about 20 x 15cm tin if that’s any help? This is a lovely simple and tasty cake. I have even made the same mix with self raising flour and found it to be just as good. Thank you for the recipe. Thank you Lorna I’m delighted to hear it!